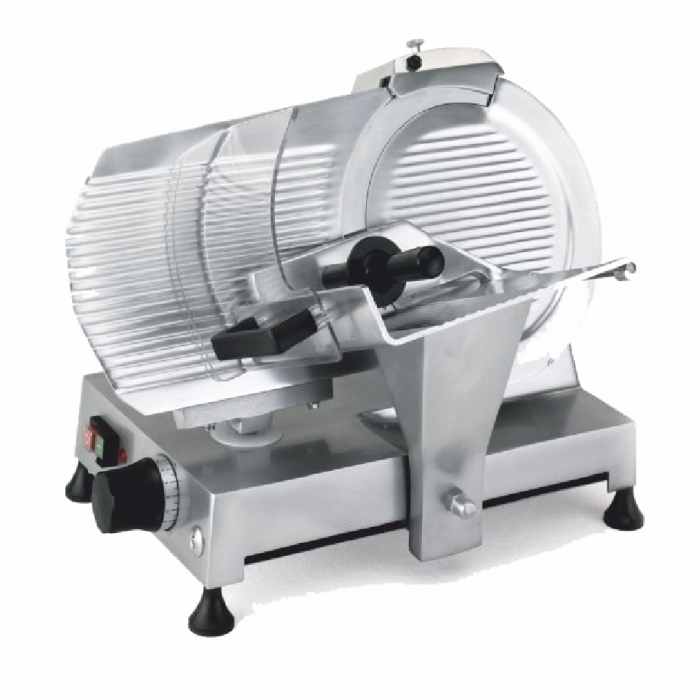 High-quality meat slicer from a renowned Italian manufacturer, designed for use in commercial catering environments. This slicer is designed specifically for cold meats, salami but is also suitable for a variety of other foods. The product features an anodized aluminium body and removable hopper for easy cleaning. The blade is made from hardened chromium plated steel for high precision slicing and durability. Blade protection, rubber feet for a firm grip, emergency stop safety switch with relay and double push start/stop button ensure that the machine is safe and secure to use. F.A.C Srl is an Italian company that have manufactured meat slicers for the commercial catering equipment market since 1963. A strong believer in the “made in Italy” philosophy, all FAC slicers are 100% realised in the national territory. Over the years FAC have increased their range to include cutters, hamburger presses, graters and much more. They provide customers with an excellent balance between quality and price. This permits great customer satisfaction and a hard-wearing commercial appliance that can meet the needs of busy chefs and commercial kitchens.